A luxurious aromatic facial designed to cleanse, exfoliate, rehydrate and nourish skin while providing stress relief and relaxation, leaving you with a silky smooth complexion and an improved state of well being. We tailor this treatment to achieve the best results for your particular skin type. 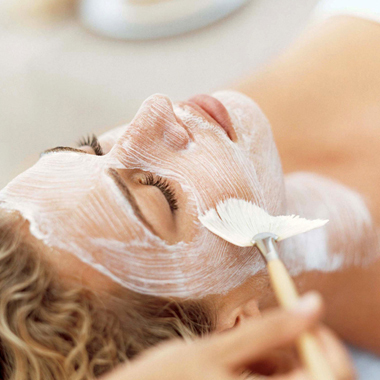 This Deep Cleansing treatment offers a truly exquisite facial. 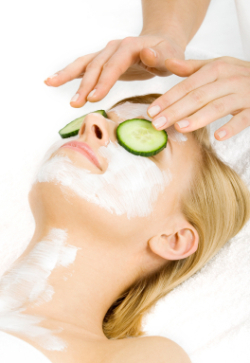 It includes cleansing, exfoliation and a unique masque along with a relaxing facial massage to smooth fine lines and relax both mind and body. This facial can improve the appearance of sun damage, fine lines, poor elasticity, or acne while enhancing the texture and clarity of the skin. This ultimate facial incorporates a facial and neck massage using hot stones to give the skin a refined texture and brilliant glow. Get your skin into peak condition! This deep cleansing facial addresses the specific needs of male skin such as razor irritation and ingrown hairs. Exfoliation and deep pore cleansing are followed with a relaxing massage to release stress and tension in face, neck and shoulders. This facial also incorporates hot stones. You'll be a new man! The hard-to-reach skin on your back will benefit from this deep cleansing treatment designed to deep clean, unclog pores and remove excess oil and impurities. It will improve the appearance and tone of the skin, as well as relax the back muscles. Includes deep cleanse, exfoliation, a purifying mask, a hydrating treatment, and massage incorporating hot stones. Hot stone Therapy works with tiny River Rocks between the toes to de-stress and stimulate the nerve endings in the feet. This treatment takes the typical pedicure to a new level by helping revive, soothe and soften tired legs and feet with traditional therapies. It begins with a whirlpool bath, as well as any callus care. The feet are then treated to a traditional Salt Scrub, A stimulating masque is then applied to detoxify, and stimulate circulation. Lastly, the feet are rinsed, and massaged. Hot towels are then applied to lock in the oils, leaving your feet luxurious. Facial quality care for hands and feet. Exfoliates, Revitalizes, Renews and Protects. For instantly visible results that improves nails and skin. This Manicure begins with a warm hand soak featuring fragrances and products unique to the seasons, nail shaping and cuticle care, followed by a moisturizing hand massage, and a professional polish application. A simple, polish-free manicure designed to clean and buff the nails. Includes nail and cuticle care, and a paraffin dip for calloused hands. This Manicure begins with a warm hand soak and scrub featuring fragrances and products unique to the seasons, nail shaping and cuticle care, followed by a moisturizing hand massage, and a paraffin treatment. Finishing with a professional polish application. Renews and Restores feet to silky smoothness. This pedicure begins with a whirlpool bath, nail and cuticle care, and callous removal. The feet are then treated to a traditional salt scrub and a foot and leg massage. The pedicure is completed with a professional polish application. A simple, polish-free pedicure designed to clean and buff the nails. Includes nail and cuticle care, callous removal and a foot and leg massage. This pedicure begins with a whirlpool bath, nail and cuticle care, and callous removal. The feet are then treated to a traditional salt scrub, A stimulating masque is then applied to detoxify, stimulate circulation, soften and moisturize. Lastly, the feet are rinsed, and massaged. A Hot Towels are then applied to lock in the oils, leaving your feet luxurious. The pedicure is completed with a professional polish application.